Seminal Adelaide Psytrance DJ with a penchant for harder styles, BRAINDUMP! 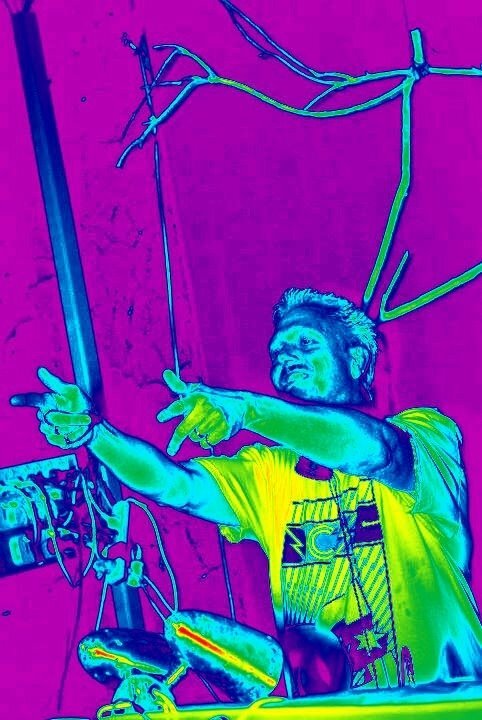 started DJ'ing over 6 years ago at age 49 because no one in Adelaide was playing the more extreme styles of Dark Psytrance that he favoured. BRAINDUMP! is easily recognisable by his distinctive spiky bleached hair, and that pumping right arm during his sets. BRAINDUMP! aka Clang, a product of the 90s rave scene, has played at many club/Psy nights in Adelaide over the years including, InPSYght, Sunny Psyde Up, Unseelie, Psymare, and the infamous GLOZONE party Hard Karma. He has also played at numerous outdoor parties such as, Reconnect, 40% JST, and Forest of the Lost Children. For some years his focus was the harder faster side of 'Dark Psytrance', but drifted into the more accessable 'Fullon' sub genre several years ago, as his 'thrash' sets started to clear dance floors. More recently he has started to enter the dark zone again, as punters in Adelaide appear to be embracing the harder side of Psytrance in larger numbers. BRAINDUMP! can also be tempted into spinning old skool Goatrance now and then, if the atmosphere is condusive, and more recently held a dance floor with a 'Psycore' set at one of the wonderfully dark Psymare parties. Clang is approachable and friendly, and has commented that the most satisfying part of the night is when/if a punter says to him " ..... sweet set man ! " BRAINDUMP! takes an enormous amount of time to pick the tracks that he plays, to make sure that every tune is a blinder ! Clang as been working on his career for the past couple years but more recently has been getting more sets. So if ya see him when ya out and about, say hello and make sure that ya jump to his set !